Description Gérôme, one of the most successful academic artists and teachers in France during the second half of the 19th century, traveled to the Near East searching for subjects. During the late 1880s, he was fascinated by animals, particularly lions. 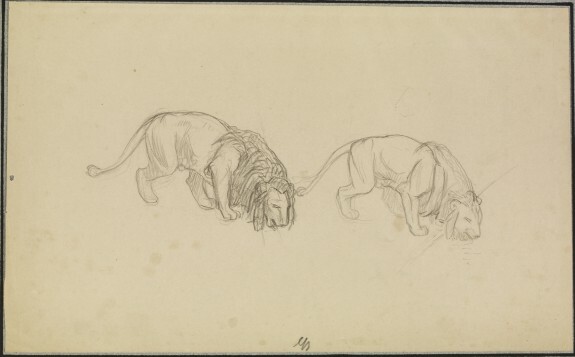 This work, in which the same lion lapping water is shown twice, may have been a study for his "Lion Drinking from a Desert Stream," formerly in the Albright Knox Gallery, Buffalo, New York. Expanding Horizons: Recent Additions to the Drawings Collection. The Walters Art Museum, Baltimore. 2010. Provenance Joseph F. McCrindle (1923-2008), New York, #A1511; Joseph F. McCrindle Foundation, New York, 2008, by bequest; Walters Art Museum, 2009, by gift.